This is Emmy (age 3) as Pebbles Flintstone and Blake (age 18 months) as Bam Bam Rubble. 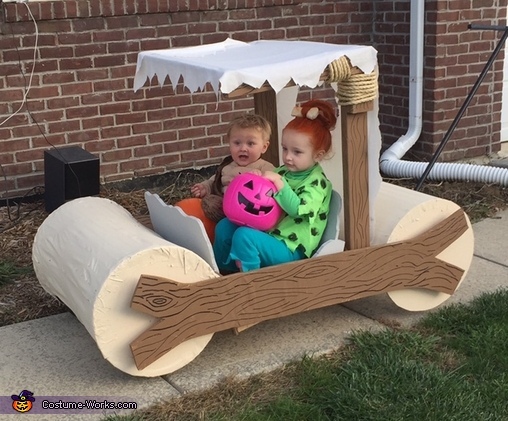 The Flintstone vehicle they're riding in was handmade by their dad, Ryan! Since moving to our neighborhood 3 years ago, we have become known for our creative Halloween costumes for the kids. This year was no exception. Ryan is an engineer and designed and built the "car" himself using wood, chicken wire, duct tape and wheels.